Our Builder’s Edition design concept is guided by our desire to elevate the guitar-playing experience to a new level of refinement in both sound and feel. Inspired by the sonic advances of our V-Class bracing, Taylor design architect Andy Powers has applied his envelope-pushing touches to similarly enhance the playing comfort. With the maple/torrefied spruce Builder’s Edition 614ce, we’ve paired V-Class bracing with player-friendly contouring to create a wonderfully ergonomic feel. 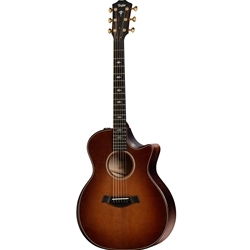 Smooth details include a beveled armrest with beveled body edge treatment; a contoured cutaway with a finger bevel for extra fretting ease up the neck; gold Gotoh 510 tuners that sport a luxurious feel and 21:1 gear ratio; and our Silent SatinTM finish, which reduces incidental noise while playing. Tonally, the combination of V-Class bracing, our Grand Auditorium body style, and the maple/torrefied spruce wood pairing together translate into an incredibly responsive guitar. V-Class’s sonic improvements â€” more volume and sustain, more harmonic agreement between notes, and remarkable consistency in the fullness of notes everywhere on the fretboard â€” give maple’s sonic transparency a remarkably player-reflective character, allowing the guitar to sound warm, bright or whatever the player decides to bring to it. The touch sensitivity is enhanced by our proprietary roasting process for the torrefied Sitka spruce top, which lowers the damping effect and delivers a more played-in tone. Striking aesthetic details include a new Wild Honey Burst on the top, back, sides and neck, our mother-of-pearl Sceptor fretboard/peghead inlay, and inset maple/black body purfling with matching rosette. The guitar comes equipped with our ES2 electronics and ships in a deluxe hardshell case.